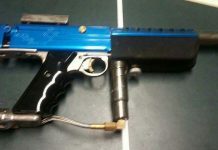 Ralph Torrell uncovered and shared photos of this custom left feed Jeff Orr Autococker, which was custom made for Mike "The Mouth" Telarico. 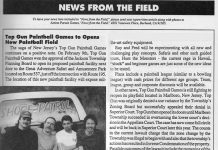 Top Gun Paintball's crew including Fred Dorski, Ray Gong, Rick Pullen and Mike Telarico, scanned from the June 1993 issue of APG. 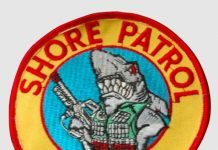 A Shore patrol Team patch that Mike Galvin sent me a photo of. Shore Patrol's hole field was Top Gun Paintball, NJ.